More than a century of innovation by the industry’s leading technicians goes into every Carrier product, including our popular thermostats. We work with homeowners to determine what you want in a basic thermostat – and we make sure we provide it. 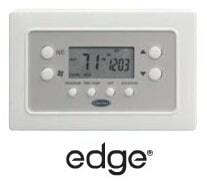 Whether it’s a non-programmable model with easy, one-touch settings or a programmable version that allows you to change you home’s temperature according to the time of day, you can be certain your product offers comfort and convenience. Carrier technology makes enjoying a comfortable home as easy as pressing a few buttons. Setting up the programmable model takes seconds – just set the time and date, add your preferred temperature settings, and your thermostat is ready. The non-programmable model is even easier – press the up or down button to set your heating and cooling temperatures and you’re done.